For nearly four years, I’ve been working on throughsmoke: an essay in notes. The manuscript started as little meditations about perfume that I wrote on my now-defunct blog, “The Gefilte Review” (RIP). One day, a friend said to me, you should turn this into a book. I laughed, finding it difficult to imagine how these disparate essays in miniature could result in anything cohesive. But, gradually, I began to take the idea more seriously. And, a few months later, I realized that I was indeed writing a new book. It took a long time to understand how to shape the manuscript, which is essentially comprised of hundreds of tiny lyrical essays. Identifying the book’s narrative threads, discerning a logic to them, was not easy. Although I’ve been writing what might be called creative nonfiction for a decade, this was my first effort at working on a book-length prose project. As is always the case with writing, one learns by doing, and the process tends to be faltering and slow. All evening, the bee has been hovering at my wrists or near the small shadow behind each of my ears. Once, I almost feel the whisper of its sting. You must be irresistible, another professor laughs. We’re standing under the trees beside the college library, clusters of faculty waiting for dinner to be served. It’s one of those obligatory social events which brings us together at the start of a new school year, we who prefer the dark enclosures of our offices to this—ticking conversations and the instability of other bodies. “Like dogs, bees are trained to find explosive materials using simple Pavlovian conditioning,” explains Rachel Herz in The Scent of Desire. “Bees learn this association very quickly and within minutes you have an army of explosive hunting bees…clustering and hovering over the location of interest.” The bee won’t stop circling. It keeps returning to the space just above my skin. I think it has mistaken the synthetic tuberose of my perfume for the stink of real flowers, night-blooming, waxy-petaled. I swat and twitch. At other tables, I see those colleagues whose faces make in me a kind of fuse. I have forgotten them all summer long. Now, watching their mouths again and the brittle shapes their gestures form in the air, I am reminded of how close I am to landmine. How close we all are. Surely, the bee smells the firing mechanism in all of us, the charge. We are each locations of interest. We are tripwire and spark. 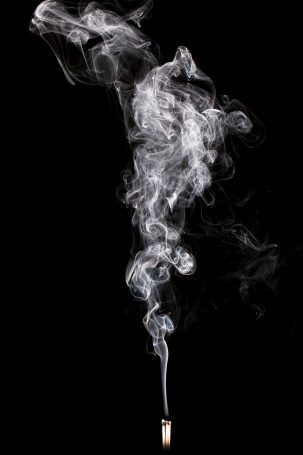 So, it was a thrill to receive the news from New Rivers Press that throughsmoke had been accepted for publication and will be released in time for the 2019 AWP Conference in Portland! I am very excited to see throughsmoke published and to call myself a “multi-genre writer.” You can read the official announcement from New Rivers Press here.